Hiring managers would do well to follow Weyerhauser’s authoritative counsel. 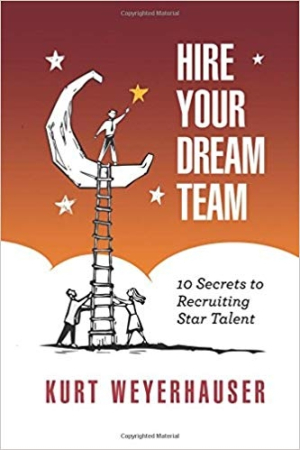 Kurt Weyerhauser’s Hire Your Dream Team forwards a convincing and comprehensive approach to hiring the right talent. A low unemployment rate often means that skilled and professional positions are harder to fill. Thanks to Kurt Weyerhauser’s experience in executive search with large companies, business managers with a need for talent now have a guidebook that steps them through the hiring process. As the hiring manager, you don’t just have a stake in the outcome of a search, you actually own the search … It’s your hire and it’s you who will have to live with the consequences for years to come. With force and candor, the book returns to this key point time and again. Weyerhauser’s approach is all-encompassing, laying out a hiring strategy with clarity and care. The first chapter presents ten methods for hiring talent; the details of each method are delved into in subsequent chapters. Many of the book’s insights demonstrate a deep understanding of the talent market; for example, its “candidate distribution curve,” depicting “the whole population of professionals capable of performing a particular job,” is a unique statistical analysis. Similarly, its “five levers” for making a job opportunity more compelling are sure to be of value to any hiring manager, as is its advice for constructing an effective position description. The book addresses not just the recruitment process but also how best to negotiate the terms of a job offer. It asserts that a great candidate is deserving of a great offer, because the quality of a hire is more important than cost and expediency over time. Most importantly, it intelligently proposes a “strategic approach to talent acquisition,” with helpful pointers for how to conduct strategic searches. The primary value of Hire Your Dream Team is its focus on strategies and techniques for the hiring manager, not the recruiter. By speaking directly to the hiring manager, the book makes it plain that their active engagement in talent acquisition will ultimately lead to recruiting a better employee. Managers would do well to follow Weyerhauser’s authoritative counsel.